We arrived in Seattle mid-morning on Friday and took the bus to our hotel and got checked in (yes, public transportation, cabs are expensive. We're in a recession, people!). Another bus took us up to Seattle University to meet Lauren as she got out of class. We went to lunch at this eclectic place called Bleu Bistro. You sit in little quirky booths with curtains that can be opened or closed. The food was as equally charming. I ordered wasabi grilled cheese sandwich. I know that it sounds weird but it was very tasty. Afterward, we went to see Lauren's house and meet her room mates (and Scoop, the dog). They all seem very nice and I know that Lauren has been pleased with the set up. 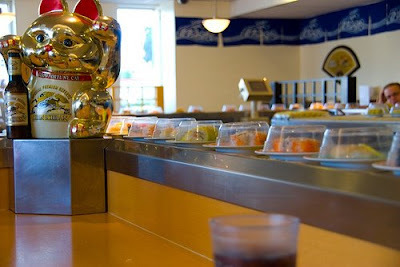 We went to Sushi Land for dinner where you pick your sushi up off a conveyor belt that moves around the restaurant. It was a bit of a challenge for me being as indecisive as I am. The plate had moved on out of reach before I could decide if I wanted it or not! Finally, we headed to the Tractor Tavern in Ballard to see the band Goodness play. Poor Lauren was the youngest person in the bar by at least a decade. It's a bit unsettling to see all those old people enjoying my favorite band. I don't look that old, do I?? Anyhow, I took a little video clip of the show to post on here but once I reviewed it I realized that it just didn't do Goodness justice. Between the camera shake from my jumping up & down and apparently singing loudly along with the songs, the clip just sucked. So, if you are curious about them check out you tube or their myspace page. I'll fill you in on the rest of the weekend in another post.